Turkey Burgers Recipe - Here is another burger recipe, people who love to eat burger this will help them a lot to make a healthy burger. Place turkey, onion, jalapeño, and spices together in a large bowl and mix together until all the ingredients are incorporated. Lightly wet your hands and use them to shape 4 circular patties about 4 inches in diameter. Heat up about 2 tablespoons of vegetable oil in a pan over medium heat. Cook burgers for 2 minutes on the first side, then flip, lower heat to low, and cook them for an additional 5-6 minutes. NOTE: the turkey burgers must be cooked through. Use a meat thermometer to check each pattie for an internal temperature of at least 165˚F before removing from pan. 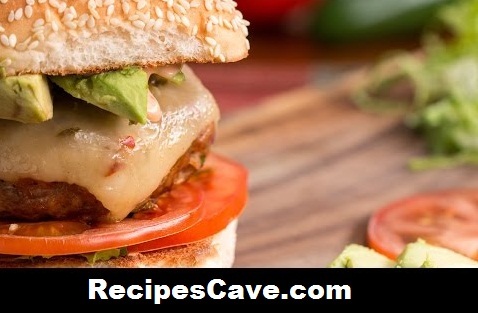 Assemble the burgers as desired with bun, lettuce, tomato, cheese, and preferred condiments. Your Turkey Burgers Recipe is Ready to taste.